BBC NEWS | UK | UK Election 2005 | From May to November? The political parties, commentators, most MPs, staff in the House of Commons and me - all have 5 May 2005 entered into their PDAs as election day. It is not, needless to say, because we have any inside information. 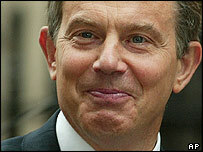 Even if Tony Blair has made up his mind, he is keeping it very close to his chest. It just seems to make sense. He will have done his four years, which has become the near-traditional time to go to the country - so no accusations of cut and run. With a bit of luck, a newly-democratic Iraq will have faded entirely from the TV screens, and Britain will be ready to "lead the world" by taking over the chairs of the G8 and the EU. Delivery on the public services may even be being felt across the nation and, who knows, even the trains might be running on time - actually, just running would do. It may even be sunny and it is set to be the date of the local elections. All of this could feed into a much-sought after feelgood factor about the government. Labour supporters traditionally are most likely to stay at home in the autumn. So imagine the horror when the head of the European Policy Forum thinktank, Graham Mather, suggests a dozen reasons why the prime minister could go to the country on 4 November 2004 - or, to put it another way, 4114. There is little doubt that the more sensible in the above expectant groups have already prepared themselves for just such an eventuality, if only mentally. And I have no doubt the political parties have got, or are in the process of getting, their campaigns ready on a "just-in-case" basis. But really - November. Everyone knows that is a no-no. The opposition is unlikely to be weaker in May than in November. It is always better to move ahead of the expectations of political commentators to avoid any sense of being "boxed in"
It rains - putting people off from turning out and voting in the first place. And Labour supporters traditionally are most likely to stay at home in the autumn. It would, as already noted, suggest the prime minister was cutting and running to capitalise on his recent turn of good fortune which may prove to be fragile. And, worse of all, that might suggest he knows something about the future development of the economy that we don't. The last time such an election was called was in October 1974 after Labour's Harold Wilson failed to get a majority government in the first election in the spring of that year. He got his majority, but only just. Since then autumn has been a non runner. And there is a danger in the prime minister allowing talk of an autumn election to grow. The last Labour Prime Minister, Jim Callaghan, did exactly that in 1978 and then delayed it until the following spring for fear of a hung parliament. He lost to the phenomenon that was Margaret Thatcher. But read Graham Mather's "12 reasons why Blair may call a November poll" - and it all goes out of the window. It is a powerful, persuasive case which will certainly cast a bit of a shadow over some people's summer holidays. But then, maybe I am too easily persuaded.